Our laboratory has extensive experience in the use of both forward and reverse genetics in zebrafish. We have cloned and characterized numerous mutant loci. More recently, we have used CRISPR nucleases to mutate several groups of loci that regulate ciliogenesis. These loci include protein deacetylases, phosphoinositide metabolizing enzymes, and regulators of apico-basal cell polarity. We use several types of microscopy to visualize cilia: conventional confocal microscopy, selective plane illumination microscopy (SPIM), and stochastic optical reconstruction microscopy (STORM). To identify binding partners of ciliary proteins, we use tandem affinity purification (TAP) followed by mass spectrometry and yeast two-hybrid screens. We also use mass spectrometry to identify post-translational modifications, such as acetylation, on ciliary proteins. In many groups of animals, sensory neurons feature prominent cilia. This image shows cilia (in green) of mechanosensory cells in the auditory system of zebrafish. Tetrahymana are unicellular creatures that live in fresh water. Their bodies are covered by hundreds of cilia. This makes them particularly suitable for certain imaging and biochemical studies. The image above shows the surface of Tetrahymena cell. Cilia are in green. A structure at the base of cilia is in red. Cilia are present on the surface of most mammalian cells. 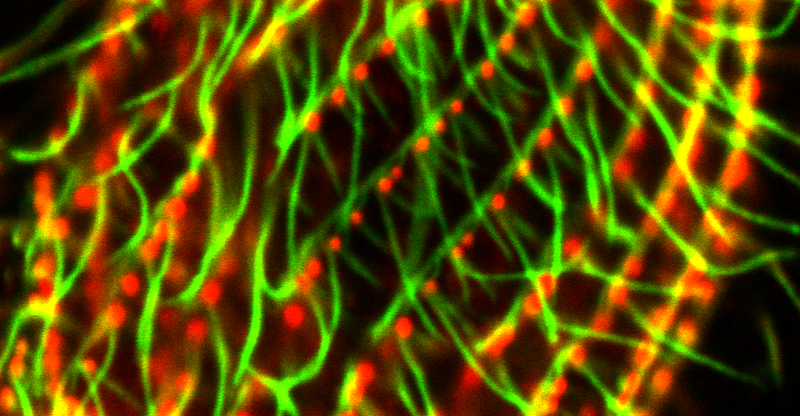 The image above shows a cilium (green) of cultured mammalian fibroblast cell. The cell nucleus is in blue. 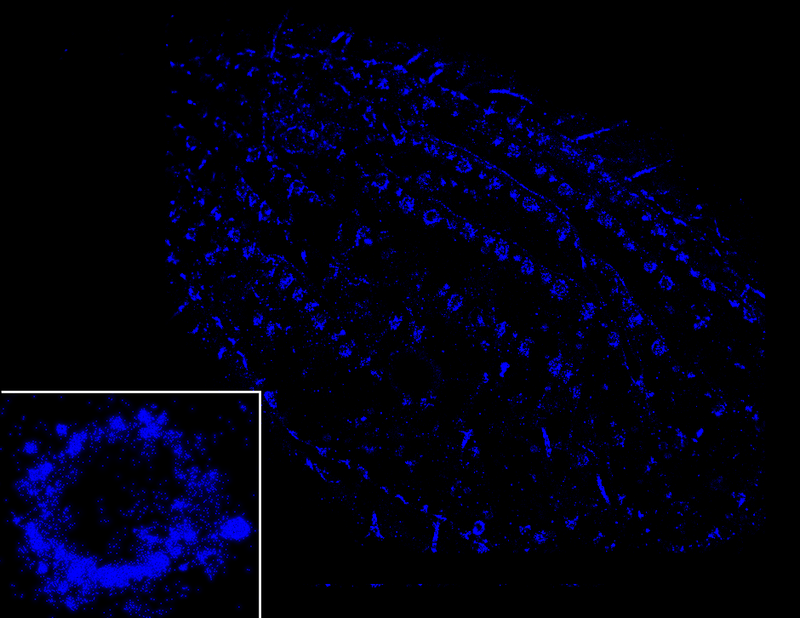 Super-resolution microscopy makes it possible to visualize circular structures at the cilia base in Tetrahymena. 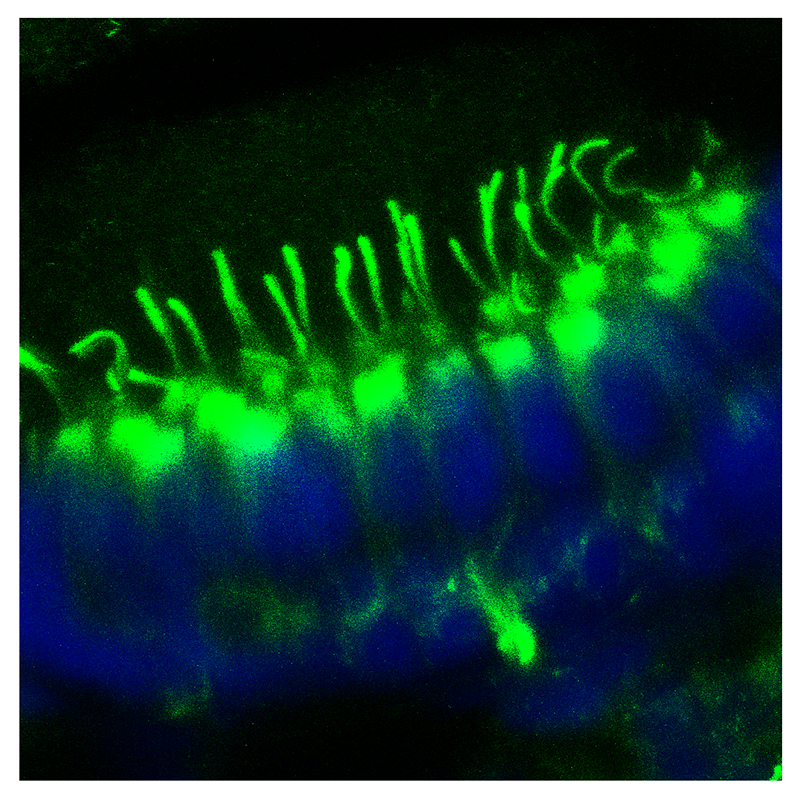 Sensory macula of the zebrafish ear. Blue dots correspond to basal bodies at the cilia base. Cilia ar abundant in many organs. This image shows cilia in the otic vesicle and surrounding tissues in the zebrafish embryo at roughly 30 hours of development. Cilia in the pronephric duct of zebrafish. This is a transverse cryosection stained with phalloidin (green) to visualize the outline of the pronephric ducts. Anti-acetylated tubulin and anti-crumbs antibodies were used to visualize cilia (blue) and the apical surface of ciliated cells (red). Cilia in the crista of the zebrafish ear. Section was counterstained with phalloidin to visualize the apical surface of the epithelium.